New Delhi, June 11, 2018: Suzuki Motorcycle India Private Limited (SMIPL), a subsidiary of two-wheeler manufacturer, Suzuki Motor Corporation, Japan, today introduced the new Access 125 with Combined Brake System (CBS). Along with the CBS upgrade, the Access 125 Special Edition also receives a new colour option - Metallic Sonic Silver with Beige Coloured Leatherette seat; reflecting the premium appeal of the portfolio. The Access 125 is powered by cutting-edge SEP technology, which boasts of impressive fuel efficiency without compromising power and performance. The CBS on the new Access 125 enables operation of both brakes from the left brake lever, helping in maintaining a good balance between front and rear brake forces. Combined brake reduces the braking distance under certain conditions. 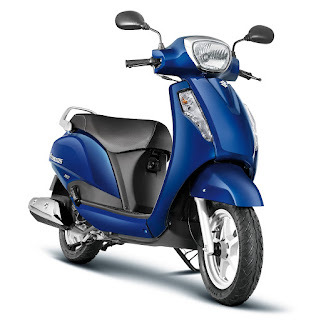 Suzuki Access 125 CBS guarantees a comfortable ride by offering a long and relaxed seat, enlarged floorboard, large under seat storage, a convenient front pocket, optional DC socket and dual convenient utility hooks. It additionally offers steel front fender and leg shield for added protection and comes with highly rigid frame layout, which results in excellent straight-line stability and cornering performance. The new Metallic Sonic Silver Special Edition also comes with the special black-coloured alloy-wheels & grab rail combined for a sporty image, and a special round shaped chrome mirrors, which give a distinctive appearance to the scooter. The Special Edition logo emblem lends the Access 125 a further unique identity. Besides Metallic Sonic Silver, the Access 125 Special Edition will be available in existing colours - Metallic Matte Black and Pearl Mirage White. The Access 125 CBS will be available in all existing six premium colours - Pearl Suzuki Deep Blue, Candy Sonoma Red, Glass Sparkle Black, Metallic Fibroin Gray, Metallic Sonic Silver and Pearl Mirage White. The new Access 125 CBS starts at INR 58,980 (ex-showroom, New Delhi) and the Special Edition is priced for INR 60,580 (Ex-showroom New Delhi).